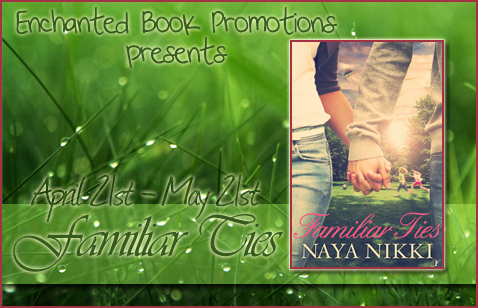 Naya Nikki's debut novel, Familiar Ties, spans seven days filled with love, pain, and happiness. This heartfelt story follows Max and Amy as they navigate the past to find each other in the present. Spurred on by the love Max's daughter, Phoebe, has for Amy's daughter, Grace, the two families struggle to define what they truly are to each other. Nikki did an excellent job of setting off the waves of emotion pouring out of this story. The characters and their problems weren't overly dramatic, but realistic enough to get a rise out of readers. Both Max and Amy were classic in their denial of the attraction they felt for one another. I'm surprised they stayed in the best friends zone for as long as they did. The little instances where Phoebe and Grace treated them like a real family are something to smile about. Their innocence and longing for a stable family, with both a loving father and mother, really showed the root of what Familiar Ties is all about. The road to happiness was indeed a rocky one, but I think the struggle the characters all faced was needed for the ending to be appreciated more. 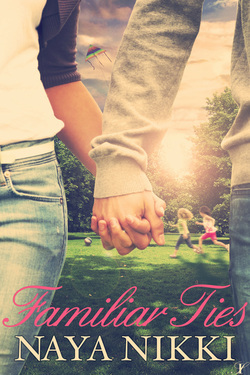 Familiar Ties is truly an uplifting story and I'm so happy to have been given the chance to review it. Every page captured my attention and left residual feelings of satisfaction after the last one.